Every once in a while, you need a place to relax and rejuvenate yourself. A place where you don’t have to worry about deadlines or the false promises. A place where you can tune out the world for a while and just immerse yourself in your surrounding. We all need such breaks in our life, such places which will give us a purpose to go back to that hustle bustle again. And I was lucky enough to have given myself a breather in one such place. 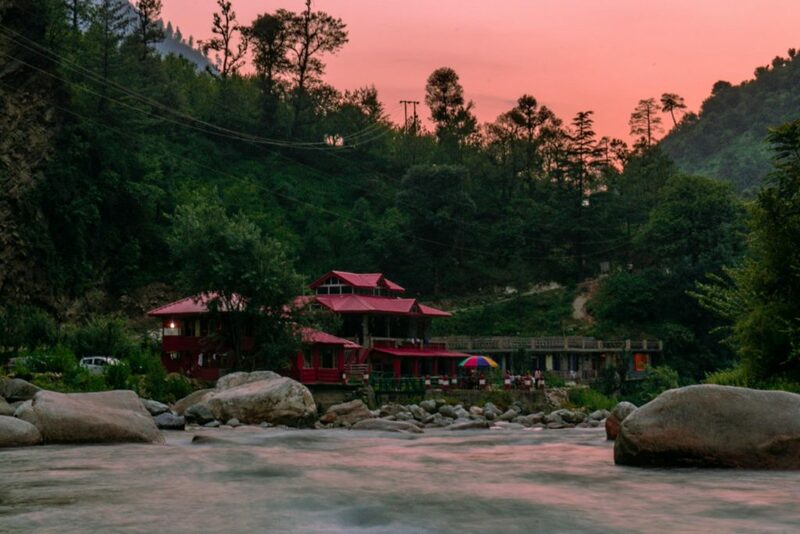 Tirthan Valley is one of the most beautiful, pristine hill stations in India where you can disconnect from the world for a while. But more than that, it was the Sunshine Himalayan Cottage which allowed me to relax and just have some fun. Trust me, I have been to many homestays, hostels, hotels, etc. but there has been no place as charming and soothing as the Sunshine Himalayan Cottage. So, I have decided to share my experience with you so that you know how it actually feels to stay in such a magical place. And maybe, experience it for yourself too by heading out to this magnificent homestay! So, how did I actually come to know about this place? Well, this would be because of the amazing team of Stay On Skill! They approached me for their SOS Meetup which was being held in Tirthan Valley this time. This was for the celebration of their 1-year anniversary. And then they told me about this beautiful homestay in Tirthan Valley which was situated just beside the river. This homestay was encompassed in a beautiful valley where we would be actually staying during the Meetup. But, when they showed me the pictures of this place, I knew I cannot pass up this opportunity. So, I accepted their invitation and that is how I landed up in this beautiful and ever-so-peaceful place! I seriously can’t thank Stay On Skills enough for inviting me to one of the most gorgeous places that I have ever stayed in. Sunshine Himalayan Cottage is this quaint homestay in Tirthan Valley, Kullu district, where you get to experience a true Himachali culture and meet some amazing people to learn things from. 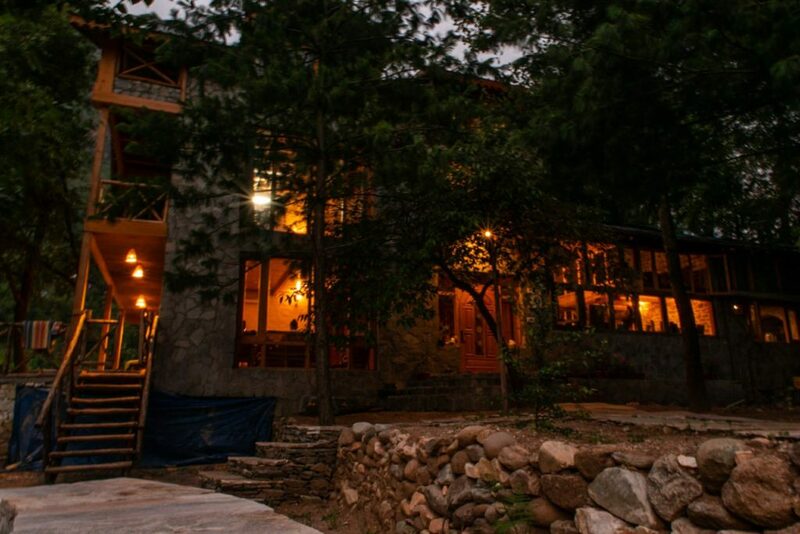 But that’s not all, the location of this homestay is the most amazing thing about it as it lies just next to the Tirthan river, allowing you to relax and unwind on the river bank. And the constant river sounds is quite soothing to your ears, especially when it is silent at night and you only have the sound of the river stream to give you company (and a few insects too). And guess what? This place also has a tree house!! Yes, you heard me right! There is an actual tree house room here where you can stay and live your own magical tales that you previously used to read in stories and novels. Apart from the tree house, you also get to enjoy a huge verandah which looks out to the river and gives you a magnificent view of the valley. Here, you would often find the host practicing Yoga and you are absolutely welcome to join them too. 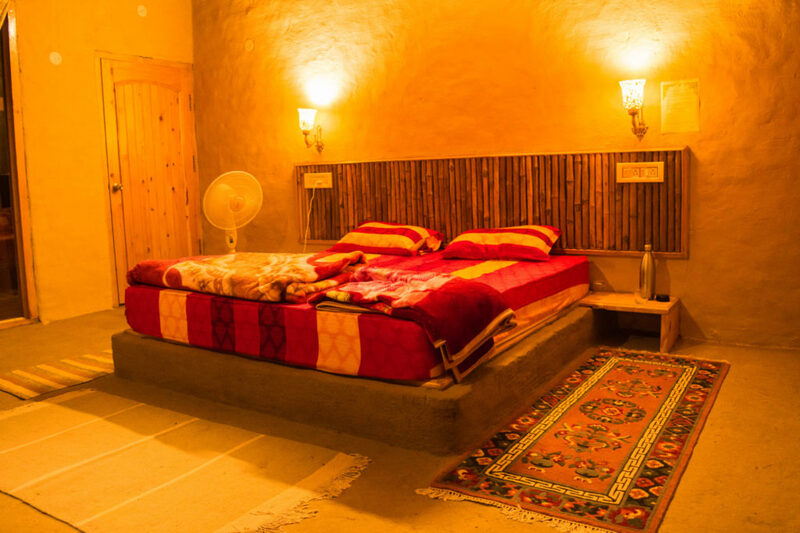 The rooms in this cottage are spacious and use mud architecture which offers a cozy and homely feel to this place. And the love and dedication with which Mr. Ankit and Panki Sood have been running this place is seriously praise-worthy. The Sood family started this homestay sometime back and have been trying to introduce Community Based Eco-Tourism in Tirthan Valley. But, why should you visit this homestay in particular? What makes it stand out from the rest of the homestays? Well, as I already mentioned above, Sunshine Himalayan Cottage has one of the best locations in Tirthan Valley and the architecture is gorgeous too. But there are several other reasons why this homestay should make it to your list. 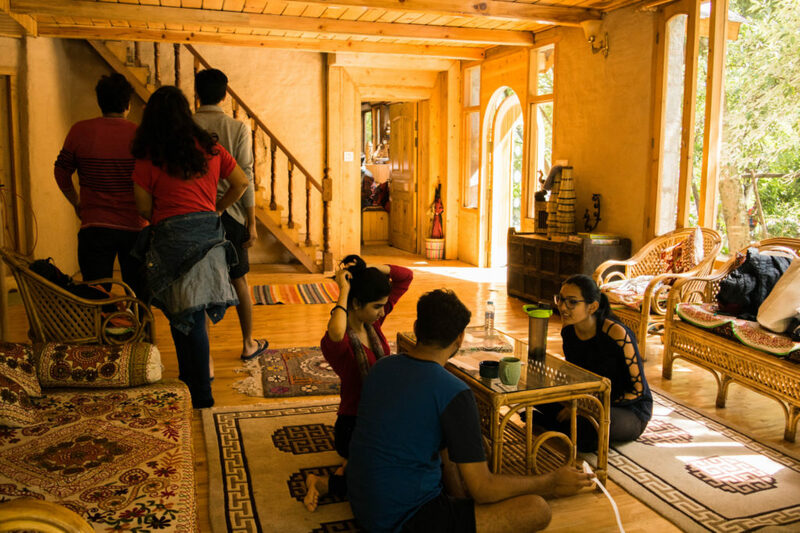 The entire Tirthan Valley follows the practice of Eco-Tourism and the Sunshine Himalayan Cottage is one of the best examples of this practice. The owners, Panki and Ankit Sood, ensure that while entertaining guests, they don’t disturb the environment of this peaceful valley. As a result, they employ rainwater harvesting, organic farming, and use sustainable methods to run their homestay. In fact, they have built the homestay using all the natural elements of the valley like stones, mud, wood, etc. and have even integrated an actual tree in the tree house to maintain the environment. And they are always working towards helping the villagers and other locals in the area to sell their products and services, all the while ensuring that Tirthan Valley is not trampled by irresponsible tourists. They also make sure that their guests don’t throw plastic in the valley and provide them with reusable water bottles for trekking in order to reduce the waste. Trust me, when you visit this homestay and stay with them for a few days, you will realize the importance of responsible traveling and would never revert back to your old, careless ways. As mentioned earlier, there is an actual tree house room in this homestay which will make your entire stay even more exciting and memorable. This room was made up using earth-friendly materials which adds a more authentic touch to this place. So, if you have ever wanted to stay in a tree house and experience a magical time then, you have to try the Sunshine Himalayan Cottage. Another great feature of this homestay is that the owners employ native, Himachali staff here. These people have been living in Tirthan Valley for a long time and know the culture of this place really well. This way, the Sood family helps out the local community by providing them with a well-paid job and further opportunities to grow. Yes, all the rooms in this homestay are love! I, myself, stayed in a top floor room which was made using the traditional mud architecture and I can say, it was by far the best room I have ever stayed in. The rooms were bathed in a golden light which made them feel even more homely and attractive. Also, the colors used to furnish the rooms were quite bright and lovely and really made these rooms stand out during the night time. A bonus for me was the big window which was placed opposite the bed. As a result, I got to witness a magnificent valley view from the safety of my room, every morning. Trust me, it was an absolute bliss. What if I told you that you can build an entire property just with the help of leftover wooden logs? Would you believe me? Yes, I know it sounds a little unrealistic but that is what Didi Contractor helped the owners accomplish. The Sood family was extremely impressed by DIDI’s mud architecture technique. As a result, they got inspired to implement the same technique in their top floor rooms as well. The Sunshine Himalayan Cottage was built by the Sood brothers after they learned about Didi Contractor, who is an eighty-year-old architect. She is famous for her use of natural elements in the construction and uses sustainable architecture methods to build new properties. One of the most amazing things about this architect is that she is a self-taught architect who is majorly into bamboo, stone, and mud architecture. She is currently helping Mr. Panki Sood build a local community center and library for the kids and to inspire the local community to use mud architecture. Both these structures will be built in the Sunshine Himalayan campus and will add more charm to this place. Another interesting tidbit of information about this homestay is that it was made using 5 different types of wood. Incredible, right? Another compelling reason to visit the Sunshine Himalayan Cottage is that it has its own organic farm. Here, they grow some local vegetables which are then used to cook some delicious dishes for the guests. So, you get to enjoy a home-cooked meal made by freshly grown, organic vegetables. Also, if you are interested in learning more about organic farming and how to do it, then you can join them in their fields too. And the homestay also has a steady supply of Desi ghee and local honey so, you can taste them here too. This is yet another inviting feature of this amazing homestay. 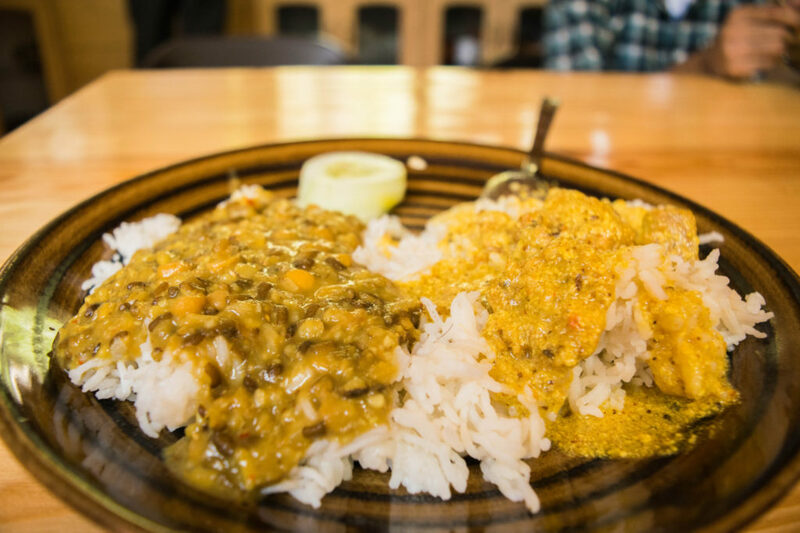 You get to taste authentic Himachali dishes which will leave your lips smacking and your stomach sated for a long time. You will get to taste the delicious Siddus along with some sweet yet enticing Rhododendron Sharbat. And the Himachali parathas, meetha chawal, khatta sabzi, etc. were so finger-licking good that I couldn’t stop myself from having multiple servings of those dishes. Apart from that, you also have a variety of pickles, jams, etc. to enhance the taste of your meal. And if you feel hungry in the evening, be prepared for scrumptious evening snacks which consist of popcorn and tea. But the dish which I loved the most was the sweet dish. Here, you will taste the most delicious custard ever and trust me, you are going to take multiple servings but still, you won’t be completely satisfied. Yes, it was that delicious! You know what makes the Sunshine Himalayan Cottage Homestay truly unique from other places? It is their readiness to keep their guests entertained by helping them out in choosing unique, fun activities to try in Tirthan Valley. They organize several trekking trips to the GHNP, Chhoii Waterfalls, etc. where they send a guide with you. And trust me, the trek to the GHNP gate is a must. Especially if you love the valley views and chilling beside the waterfalls. Apart from the treks, you can also experience river crossing, trout fishing, etc. here. This is definitely a great way to really enjoy your time in this wonderful land. That’s not all though, they also organize village walks and bird watching sessions to give you a more authentic feel of this valley. And if you love camping beside the river then don’t worry, they will arrange this for you too. Frankly, this homestay is a great chance for you to see the true Tirthan Valley. And you never have to worry about getting bored here. Because the homestay owners can arrange activities to keep you occupied. So, you can easily get the most out of your trip to this amazing valley. Yes, yes, yes! One of the highlights of your trip here would be the amazing beings who live in his homestay along with the owners. I can assure you that you will fall in love with Gabbar, Sambha, and Jai who will be ever so enthusiastic to greet you and play with you. Apart from those loving playmates, you also have many books here on Tirthan Valley and GHNP to keep you occupied. Also, some games for people or families who love to play and would love to just relax and enjoy themselves. But mostly, you will get to listen to Mr. Panki Sood’s inspiring and life-changing stories. How he turned his life around and has become such an important figure of the Tirthan Valley association and the numerous stories about his encounters with the wildlife here. You will learn how he changed his life after 12 years of drug addiction, how he saved a bear Cub’s life and how he fulfilled a Nepali stranger’s last wish for the sake of humanity. Trust me, you will learn a lot from his stories and would wish that you could have some of these experiences for yourself too. And maybe, just maybe, you will return a changed man from this trip. I thoroughly enjoyed my 2-night stay in this beautiful homestay and really loved getting to know other talented people who came for this Meetup. We hung out a lot in the living room where we talked, sang songs, danced, and really got to know each other and just heard so many wonderful, inspiring stories. And I am not exaggerating when I say that this is one of the liveliest and most comfortable living rooms I have ever come across. The verandah is the place where I spent most of my mornings and the evenings. I clicked photos of the sunset or the valley or just sat and observed my surroundings. Here, I could hear the soft gushing of the river while lounging on a comfortable chair and could just let myself relax for a little while. The cool, crisp air further rejuvenated me and was a welcome change from the hot, humid air of Delhi. I enjoyed every moment of my stay here, from the village walk to the chilling in the lagoon or singing along the guitar tunes. Each of the moment spent in this gorgeous place is close to my heart and I would definitely like to return here whenever I can. To reach the homestay, you will first need to reach Aut and then Tirthan Valley. Take a Manali bus and then get down at Aut. If you are planning to take a bus, then you would need to go to the bus stand and take a bus which is leaving for Banjar or Gushaini. If you are planning to take a taxi, then get down before the Aut tunnel. You can book a taxi to Sunshine Himalayan Cottage by calling +91 98057 84599/ 70182 41799. If you would like to book your stay here, then you can contact them via the following portals. Stay On Skill is a travel association started by Arjun Tuli which aims to bring respite to travelers by providing them stay in exchange for their skills. This great initiative has already made life easier for a lot of travelers and has made it possible for them to travel far and wide. However, that’s not all. This travel organization also helps local travel companies and organizations by providing them more exposure so that more people can use the facilities and services provided by these organizations and companies. They also help out budding hostels, homestays, etc. so that more people can become aware of these amazing establishments. My experience with this organization has been completely amazing so far. And I can genuinely say that they actually care about the work they do. Thanks for another fantastic article. Where else may anyone get that kind of info in such a perfect manner of writing? I have a presentation subsequent week, and I am on the search for such information. It is truly a nice and useful piece of information. I am glad that you just shared this helpful information with us. Please stay us informed like this. Thank you for sharing.